Two young Scandinavian tourists were massacred in the Imlil mountain range near Marrakech, Morocco. The international media, especially the French, have not talked about it » too much » and yet it is indeed Islamist terrorism (the very same islam terrorism who hit during the Christmas holidays in Strasbourg and who hit Charlie Hebdo and Bataclan), committed by European citizens and a from a neighboring country by the sea! Western chancelleries do not wish to offend « their » friend the king, not to scare investors and tourists and especially to make believe that Moroccan terrorism is « Berber » and mountainous, exactly what Algeria did in the Azawad and always tries to do in Kabylie. The execution of French mountaineer Hervé Gourdel in 2014 was an example of their machiavellian actions. However, in reality, islamist terrorism in Algeria, Morocco, Tunisia and for ten years in France and Europe is encouraged, fomented or even funded by North African dictatorships inspired by the Arab-islamism to maintain power and squander wealth. First by the school and the media, by mosques and imams, then by infiltrations and manipulations of all kinds, as was the case with the execution of the monks of Tibhirine in 1996 in Medea in Algeria, which does not prevent European politicians from « maintaining » good relations with the bloody dictatorships of the South. One would think that Damascus and Baghdad are closer to Paris than Algiers and Rabat. All this to the detriment of the indigenous inhabitants of North Africa and especially the civilian victims on both sides of the Mediterranean, « collateral damage » of the false diplomatic relations and of occult financial operations! No, terrorism is not Berber, it is not Amazigh. Tamazgha, formerly Numidia, is a land of freedom, its native population is welcoming and open. It will remain so despite invaders and compromises of all kinds. 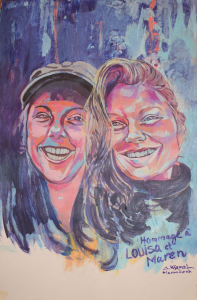 Painting by A. Khamal in tribute to Louisa and Maren.